-IPL PHOTOS: Who sizzled, Shilpa or Preity? Tell us! 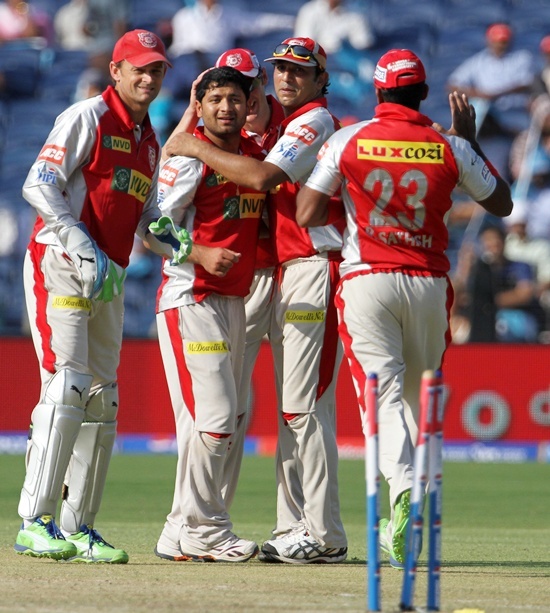 Kings XI had begun their campaign on a winning note against Pune Warriors but had failed to sustain the momentum against Chennai Super Kings and Rajasthan Royals. In fact, in their match against Rajasthan on Sunday night, they were handed a royal thrashing with the opposition running away with a comfortable six-wicket win. For Kings XI to make a contest against KKR, who start as clear favourites at the PCA Stadium, they would need the likes of Gilchrist, David Hussey, Mandeep Singh, Gurkeerat Singh, R Sathish to fire in unison. KKR would look to repeat their power-packed batting performance against Hyderabad. It was a team effort and nothing less than that would satisfy the Knight Riders on Tuesday as well. The likes of Brett Lee and Laxmipathy Balaji on the fast and bouncy Mohali wicket would be a treat to watch.Besides, 'mystery spinner' Sunil Narine is a dangerous turner of the ball. Kolkata Knight Riders: Gautam Gambhir (C), ManvinderBisla, Jacques Kalis, Yusuf Pathan, Manoj Tiwary, Eoin Morgan,Rajat Bhatia, Ryan McLaren, Pradeep Sangwan, Sunil Narine,Laxmipathy Balaji, Brendon McCullum, Brad Haddin, Ryan tenDoeschate, Sachithra Senanayake, Laxmi Ratan Shukla, SarabjitLadda, Debabrata Das, Iqbal Abdulla, Mohammad Shami Ahmed. Kings XI Punjab: Adam Gilchrist (C), Azhar Mahmood, LukePomersbach, David Hussey, David Miller, Dimitri Mascarenhas,Manpreet Gony, Nitin Saini, Parvinder Awana, Paul Valthaty,Piyush Chawla, Praveen Kumar, Rajagopal Sathish, Ryan Harris,Bhargav Bhatt, Bipul Sharma, Gurkeerat Mann Singh, HarmeetSingh Bansal, Manan Vohra, Aniket Choudhary, Mandeep Singh,Sandeep Sharma, Siddharth Chitnis, Sunny Singh. IPL Stats: Praveen Kumar is most economical bowler! IPL PHOTOS: Who sizzled, Shilpa or Preity? Tell us!